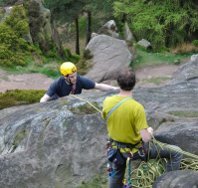 Sheffield’s Castle Mountaineering Club is holding an open climbing weekend on the 12 and 13 May, providing the opportunity to find out more about the Club and meet some of its members. The weekend will focus on rock climbing on the Peak District’s glorious gritstone. Have you spent all winter down at the wall and want to move outdoors, are you an experienced climber looking for a climbing partner or do you want to find out more about what rock climbing involves? This weekend provides the opportunity to meet fellow climbers of a range of abilities and ages. We plan to climb at Stanage (Popular End) on Saturday and Burbage North on Sunday, starting at 10.30 am on both days. However, it might be raining, meaning a change of venue, so contact us in advance. Contact Gary Sheppard, Membership Secretary, on 07846 285142 or via e-mail.